If I'm visiting Sydney, I can visit the Place Pages of popular destinations like the Opera House, Aquarium, and Garden Palace to see photos, find nearby public transit, and even discover related maps users have created with landmarks in Australia. For businesses, I can check out "More Details" to see where all the information is coming from or even edit to add my own information or reviews. 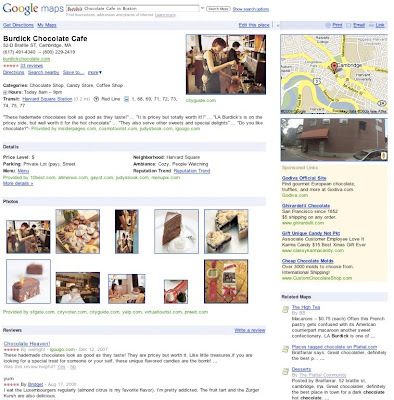 For example, if I look at the Place Page for my favorite chocolate shop, Burdick Chocolate Cafe in Boston, I can see relevant photos, read all the user reviews, browse the menu, see their hours, and even find out what transit lines take me there. We think Place Pages will make searching much easier (and hopefully more fun!) for our users, but we're also excited about what it means for business owners. By default, users looking for local businesses can easily view ratings for your business, reviews, related maps, find nearby transit options showing them how to get to you, and take a look at your business with a Street View preview - and it's all on one page. If you claim your listing with the Local Business Center, you'll be able to make sure there's even more rich content on the Place Page, like photos, YouTube videos, hours of operation, types of products or services offered, and several other categories you can submit. You can even add a coupon that will appear on your Place Page to really entice potential customers. By editing your Local Business Center listing your place page will automatically be updated. Another nice benefit of Place Pages for Google Maps is that they will come with a friendly URL that will make it easy to remember and link to. For example, you'll find the San Francisco Place Page at google.com/places/us/california/san-francisco-city. We're working on rolling this out for all Place Pages; right now we include cities and most businesses; if your business isn't included just yet, we're working on it! If you want to learn a bit more before trying it out for yourself, you can read our post on the Official Google Blog - then start exploring all sorts of places! When you're looking for information about a restaurant down the street or a museum across the country, you sometimes find relevant information is scattered across the web. Instead of doing the research all over the web, wouldn’t it be great to see all the information for that place in... one place? Starting today, you can do that with Place Pages for Google Maps. A Place Page is a web page for every place in the world, organizing all the world's information for that place. And we really mean every place: there are Place Pages for businesses, points of interest, transit stations, landmarks, and cities all over the world. To find a Place Page, click on "more info" in your Google Maps search results or "more info" in the info bubble on the map.